Visual Studio 2017 solution. Microsoft SQL Server 2014 database (LocalDB). Includes C# and VB projects. This tutorial shows how to use DayPilot ASP.NET Scheduler to build a hotel room booking application. 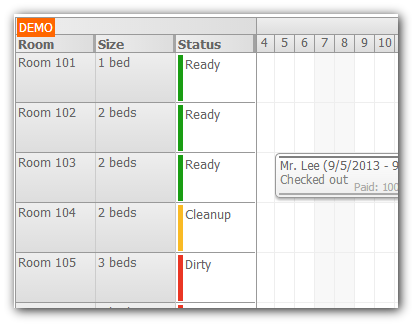 It's a sample ASP.NET web application with support for room status (clean, dirty, cleanup), reservation status (new, confirmed, arrive, checked-out, expired). 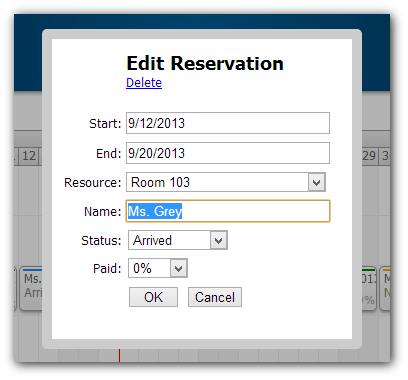 It supports drag and drop reservation creating and moving, modal dialog for editing reservation details (name, dates, status, etc.). Licensed for testing and evaluation purposes. You can use the source code of the tutorial if you are a licensed user of DayPilot Pro for ASP.NET WebForms. Buy a license. This tutorial includes a sample SQL Server (2014+) database (daypilot.mdf). The [Reservation] table stores the events (reservations). The [Room] table stores the room details. 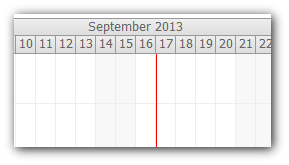 We will use a separator to insert a red vertical line highlighting the current time. Each phase will use a specific DurationBar color. The color is assigned using BeforeEventRender event handler. 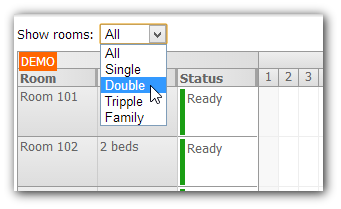 No room can be booked for two guests at the same time (no overlap allowed). The reservations that already checked in can't be moved to another room. The start of reservations that already checked in can't be changed. The end of reservations that already checked out can't be changed. The Scheduler handles the drag&drop user actions (move and resize) using EventMove and EventResize event handlers. message = "The room cannot be changed anymore." message = "The reservation start cannot be changed anymore." Note that the database is updated only when the change meets the rules. Because the requested change is not allowed in some cases we need to notify the users about the reason. The Scheduler can send a custom message to the client using UpdateWithMessage() method. We add a DropDown control just above the Scheduler control to enable room filtering. DayPilot Scheduler has a special client-side property which is sent to the server with every callback (ClientState). The selected value is stored in clientState after every DropDown selection change. Copy modal.js to js directory. Copy Modal.cs to App_Code directory. The most important command is assigning the .closed handler. This handler will check the result sent from the modal and refresh using commandCallBack if changes were made. All tutorials include a sample Visual Studio project with C# and VB.NET source code. A simple ASP.NET application that allows creating courtroom reservations from a list of unscheduled cases using drag&drop. Sample web application that uses DayPilot ASP.NET scheduler control to display reservations from a database. Includes a Visual Studio solution with C# and VB projects and an SQL Server database.